China has warned that “conflict could break out at any moment” as tension over North Korea increases. Foreign Minister Wang Yi said if war occurred there could be no winner. Mr Wang’s comments come as the US voices increasing concern at North Korea’s development of nuclear weapons and deploys a Navy carrier group off the Korean peninsula. China, North Korea’s only backer, fears conflict could cause the regime to collapse and problems on its border. Mr Wang said: “One has the feeling that a conflict could break out at any moment. North Korea has warned the US not to take provocative action in the region, saying it is “ready to hit back with nuclear attacks”. The comments came as North Korea marked the 105th anniversary of the birth of its founding president, Kim Il-sung. A huge parade in Pyongyang was held amid speculation current leader Kim Jong-un could order a new nuclear test. Among the hardware on display appeared to be new intercontinental and submarine-launched ballistic missiles. Chinese Foreign Minister Wang Yi and his Russian counterpart, Sergei Lavrov, held a strategic communication via phone Friday on bilateral ties, the situation in Syria and the Korean Peninsula. The two foreign ministers pledged to actively implement the consensus reached by the two countries’ heads of state on the development of China-Russia relations and to prepare for a series of high-level exchanges in the near future. The two ministers stressed that China and Russia enjoy solid mutual trust and are ready to strengthen strategic coordination in regional and international affairs. On the situation in Syria, Wang said the independence, sovereignty and territorial integrity of Syria should be respected, adding that a top priority of the moment is to conduct an independent, just and professional investigation into the use of chemical weapons in the country. He said he believed that the fact will come to light. On the Korean Peninsula, Wang said, preventing war and chaos on the peninsula meets the common interests of China and Russia, and pulling all the parties back to the negotiating table is the common goal of the two countries. China is willing to coordinate closely with Russia to cool down the situation on the peninsula and push the related parties to resume dialogue, he said. Lavrov said that Russia and China enjoy frequent high-level exchanges, ever deepening mutual trust and fruitful results from bilateral cooperation in various fields. He said Russia is in favor of a fair investigation into Syria’s chemical weapon issue as soon as possible and a resumption of dialogue on the Korean Peninsula issue. Leave a commentEdit"Chinese, Russian FMs discuss Syria, Korean"
Leave a commentEdit"Quake of M6.2 – hit ANTOFAGASTA, CHILE"
With two reports one from Afghanistan and another from US has reported the loss of life nearly one hundred of terrorist. An Afghan official has said that more than 80 terrorists were killed when US military aircraft dropped Massive Ordinance Air Blast (MOAB) bomb in Afghanistan in Thursday. Attaullah Khogyani, a spokesman for the Nangarhar provincial governor’s office said that at least 82 terrorists were killed as a result of the bomb strike. US military aircraft dropped the 22,000-pound MOAB, nicknamed the Mother of All Bombs in Afghanistan’s Nangarhar Province. MOAB is the largest non-nuclear bomb in the US arsenal. Earlier yesterday, an Afghan Defense Ministry spokesperson had said that at least 36 terrorists of Islamic State group were killed in the US bomb attack. According to Washington, the MOAB was dropped to destroy a system of underground tunnels and caves in Nangarhar, used by IS terrorists. The MOAB has been in service in the US military since 2003, but Thursday marked the first time the bomb was used in a combat action. The cost of a single MOAB is 16 million dollars. At least 90 Islamic State terrorists were killed by a huge bomb dropped by the United States in Afghanistan. The Governor of the Achin Province, Ismail Shinwary gave this information. The most powerful non-nuclear bomb ever used by the US in combat was dropped on an IS base in Achin district of Nangarhar, bordering Pakistan. US official said, a network of tunnels and caves was destroyed when US military aircraft dropped the 22,000-pound GBU-43-Massive Ordnance Air Blast bomb (MOAB), the Mother of All Bombs. The bomb was dropped after fighting intensified over the past week and US-backed ground forces struggled to advance on the area. Afghan President Ashraf Ghani’s office said in a statement the attack was a part of a joint operation by Afghan and international troops. The strike came as U.S. President Donald Trump prepares to dispatch his first high-level delegation to Kabul, amid uncertainty about his plans for the nearly 9,000 American troops stationed in Afghanistan. Leave a commentEdit"80 terrorists killed 10Kg,Bomb of bomb in Afghanistan"
The President of India, Shri Pranab Mukherjee has conveyed his greetings and felicitations to Her Majesty Queen Margrethe II, the Queen of the Kingdom of Denmark on her birthday which falls on April 16. Queen Margrethe II is the Queen of Denmark. She is also the supreme authority of the Church of Denmark and Commander-in-Chief of the Danish Defence Forces. Queen Margrethe II ascended the throne on the death of her father, King Frederick IX, on 14 January 1972. On her accession, Queen Margrethe II became the first female monarch of Denmark since Margrethe I, ruler of the Scandinavian countries in 1375‒1412, during the Kalmar Union. Birthday of Queen Margrethe II of Denmark is celebrated on April 16. It is not a public holiday in Denmark, but the Queen typically makes an appearance, and some events are held to celebrate the monarch.Princess Margrethe was born on April 16, 1940 to Crown Prince Frederick (future King Frederick IX of Denmark) and Princess Ingrid. On April 1947, Kind Christian X died and her father succeeded to the throne. The royal couple had three daughters at the time, and it was clear that Queen Ingrid would have no more children. It was decided to change the constitution so that Princess Margrethe would be able to inherit the throne. The new Act of Succession was accepted in 1953. In 1967, Margrethe married count Hernri de Laborde de Monpezat, a French diplomat. On January 14, 1972 her father died and she ascended the throne, becoming the first female Danish sovereign. Her main tasks as the Danish monarch are to be a unifying figurehead at home and to represent the country abroad. On her birthday, the Queen usually appears either on her balcony at Amalienborg Palace (the winter residence of the royal family) or outside the Marselisborg Palace (the summer residence of the royal family) depending on where she has decided to spend her holiday. In his message, the President has said, “On behalf of the Government and the people of India and on my own behalf, I have great pleasure in extending warm greetings and felicitations to Your Majesty on the occasion of Your Majesty’s Birthday. Your Majesty’s commitment to and contribution in promoting friendly relations between Denmark and India is highly appreciated. I am confident that our two Governments will continue to work for further strengthening these close ties for the mutual benefit of our peoples. I would also like to convey to Your Majesty my best wishes for your good health and well-being for the continued progress and prosperity of the friendly people of the Kingdom of Denmark”. Leave a commentEdit"Queen of Denmark Birthday"
The Indian delegation led by the Commerce and Industry Minister Smt. Nirmala Sitharaman met Mr Hiroshige Seko, Minister for Trade Economy and Industry (METI), business leaders of Japan and addressed a gathering of about 250 participants at the India Investment Seminar organized by Japan External Trade Organization (JETRO) in Tokyo today. At the India Investment seminar, Mr Hiroyuki Ishige, Chairman & CEO, JETRO spoke of the enormous interest of Japanese companies to diversify beyond automotive sector. Indian ambassador to Japan, Mr. Sujan R. Chinoy, mentioned that Commerce and Industry Minister’s visit would further strengthen our existing strategic relationship with Japan. Smt. Sitharaman in her keynote address acknowledged the experience and contribution of Japanese companies in India. The Minister talked about investment opportunities available in India with the goal to increase contribution of manufacturing sector to 25% of GDP by 2025. She also spoke of the various reforms and initiatives like National Investment and Infrastructure Fund (NIIF) for enhancing infrastructure financing, Digital India program to connect 250,000 villages with optical fiber and Jan Dhan Mission. Mr. Ramesh Abhishek , Secretary DIPP in panel discussion on ‘Make in India’ threw light on the massive investment potential of India. By 2025, India will be the world’s youngest nation with average age of 29 years and have a GDP of USD 20 Trillion in Purchasing Power Parity (PPP) terms. The ‘Make in India’ program is driving the change in mindset to cater to this huge potential. He gave examples of Business reform action plan (BRAC) on which states are being ranked on Ease of Doing Business (EODB) and upgradation of Intellectual Property Regime. It was discussed that the Electric Vehicles, Renewable Energy, Medical Devices are the sectors of the future providing diversification opportunities to Japanese investors. Mr. Shaurya Doval, Director India Foundation, stressed that the Government has increasingly turned business friendly in India and considers businesses as equal partners in India’s growth. Mr. N.K. Singh, former Member of Parliament, concluded the panel echoing the positive sentiment on investing in India. During the bilateral meeting with the METI Minister, issues inter alia including progress on Japanese Industrial Townships, bilateral trade, diversification of investment sectors and resolution of difficulties faced by Indian Pharmaceutical and IT companies in Japan were discussed. The Commerce Minister also met leading Japanese companies in Automotive, Healthcare, Internet and Energy sector and discussed opportunities and their plans for India. Leave a commentEdit"MinNirmala :India to increase the contribution of manufacturing sector to 25% of GDP"
Eight coaches of Meerut-Lucknow Rajya Rani Express derailed near Rampur in Uttar Pradesh early morning at 8 AM on Saturday leaving at least 10 passengers injured, railway officials said.The accident happened between Mundapandey and Rampur railway stations, Northern railway spokesperson Neeraj Sharma said.He said there was no casualty in the accident.The cause of derailment is not known. 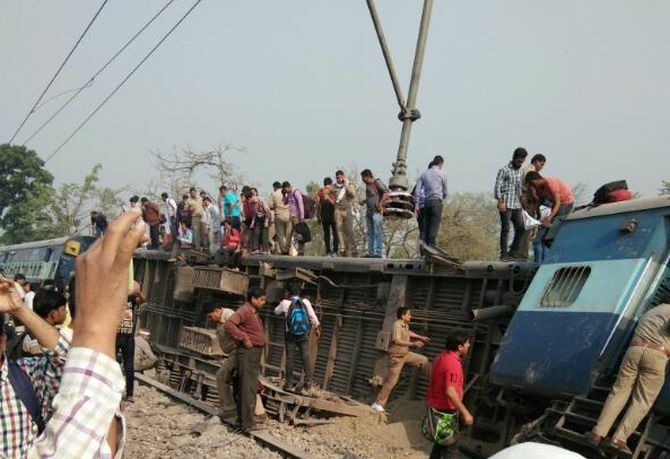 Railways announced Rs 50,000 as compensation to those injured in Rajya Rani Express derailment. UP Chief Minister Yogi Adityanath expressed grief and has announced compensation worth Rs 50,000 each for the severely injured and Rs 25,000 each for the injured.The chief minister has also instructed state cabinet minister Baldev Aulakh to extend all possible help to the injured. Railway Minister Suresh Prabhu has also ordered an inquiry into the derailment saying that strict action would be taken against those found guilty. Prabhu further said he was personally monitoring the situation and has directed the senior officers to rush to the spot. Leave a commentEdit"Rajya Rani Express derail"
Delhi Chief Minister and Aam Aadmi Party National Convener Arvind Kejriwal met with the Delhi State Election Commission to urge the body to not use Generation 1 EVMs manufactured before 2006 to conduct the Municipal Corporations of Delhi election. The polls must be conducted with EVMs with the VVPAT machines and if not, with paper ballots even if that means the election has to be delayed by a few days. The delegation to meet the SEC included senior AAP leaders Sanjay Singh, Ashutosh, Ashish Khetan, Dilip Pandey, Atishi Marlena, Raghav Chadha and MLA Somnath Bharti. Leave a commentEdit"CM Arvind Kejriwal urges Delhi SEC to use Generation 2 EVMs"
Started writing this book from the age of 17, and completed by 18. She started her own successful food blog in 2015. You are requested to send correspondents/ photographers/ camera crew for the Launch. Leave a commentEdit"‘The Spirit of the River’"
Leave a commentEdit"Invite for 57th Gujarat Gaurav Divas Pre Celebrations"
Leave a commentEdit"Merchandise exports and imports grows by 27.6% and 45.2% respectively during March 2017"
Department of Agriculture Cooperation & Farmers Welfare (DAC&FW) in consultation with NITI Aayog, identifies a set of 9 marketing reforms to be made in Agriculture Produce Marketing Committee (APMC) Acts – A national consultation to review the progress of adoption of reforms and other initiatives in the agri-marketing sector aimed at enhancing farmers’ income was held yesterday, under the Chairmanship of Dr. Ramesh Chand, Member, NITI Aayog. The meeting was also attended by Shri S.K. Pattanayak, Secretary DAC&FW, Dr. Ashok Dalwai, Additional Secretary, DAC&FW, senior officers from DAC&FW, Niti Aayog, Ministry of Environment, Forests & CC and Department of Agricultural Marketing, Forest and Revenue from the State Govts /UTs. DAC&FW has, in consultation with NITI Aayog, identified a set of 9 marketing reforms to be made in Agriculture Produce Marketing Committee (APMC) Acts of the States/UTs. These include 3 mandatory reforms enabling integration to e-NAM viz provision for e-trading, unified trading license and a single point levy of market fee, as well as setting up markets in the private sector, direct marketing, etc all aimed at reducing the intermediaries between producer and buyer so as to ensure remunerative prices to the farmer. The States were also advised to relax the felling and transit rules for trees being grown by farmers on their own lands so as to encourage agroforestry which has a huge potential for supplementing the income from agriculture. ü Business Reform Action Plan 2017 – The Department of Industrial Policy and Promotion (DIPP), Ministry of Commerce and Industry, in partnership with the World Bank Group, released the Business Reform Action Plan (BRAP) 2017 for implementation by States/UTs on 13.04.2017. The BRAP includes 405 recommendations for reforms on regulatory processes, policies, practices and procedures spread across 12 reform areas, that is, labour regulation enablers; contract enforcement; registering property; inspection reform enablers; single window system; land availability and allotment; construction permit enablers; environmental registration enablers; obtaining utility permits; paying taxes; access to information and transparency enablers and sector specific reforms spanning the lifecycle of a typical business. This year there are 103 new set of reforms (out of 405) focusing on central inspection system, online land allotment system, online single window system for granting construction permits, registration under Inter State Migrant Workmen (RE&CS) Act, 1979, approval for boiler manufacturer and boiler erector etc. BRAP 2017 also includes two new sectors i.e. Healthcare and Hospitality. The last date to implement the reform is 31.10.2017.
ü Hon’ble Commerce Minister emphasises the potential for synergies between India and Japan – The Indian delegation led by the Hon’ble Commerce and Industry Minister of State Smt. Nirmala Sitharaman, participated in day-long India conference in Nagoya city, in Aichi Prefecture of Japan. Governor of Aichi Prefecture , Mr. Hideaki Ohmura thanked the Ministry of Commerce and Industry for establishing the Aichi Desk in 2016 within the Department of Industrial Policy and Promotion (DIPP). Governor Mr. Hideaki acknowledged that the India Conference will further encourage the companies in Aichi Prefecture to invest in India . Smt. Sitharaman commended the contribution of Aichi Prefecture towards manufacturing value addition despite high savings rate among the Prefectures in Japan . It was discussed that India could learn from Aichi Prefecture as to how manufacturing can grow along with savings. The Minister acknowledged the increase in FDI from Japan in recent years. Although Japan is the 3rd largest foreign investor in India (USD 25.2 Billion in cumulative FDI during the April 2000 – December 2016), behind Mauritius and Singapore (ranked 1 and 2) , it can be considered a top investor as the other two countries are used by companies from across the world to route investments. ü Hon’ble Minister of Commerce and Industry Minister highlights the investment opportunities available in India to increase the contribution of manufacturing sector to 25% of GDP – The Indian delegation led by the Hon’ble Minister of Commerce and Industry Smt. Nirmala Sitharaman met Mr Hiroshige Seko, Minister for Trade Economy and Industry (METI), business leaders of Japan and addressed a gathering of about 250 participants at the India Investment Seminar organized by Japan External Trade Organization (JETRO) in Tokyo today. At the India Investment seminar, Mr Hiroyuki Ishige, Chairman & CEO, JETRO spoke of the enormous interest of Japanese companies to diversify beyond automotive sector. Indian ambassador to Japan , Mr. Sujan R. Chinoy, mentioned that Commerce and Industry Minister’s visit would further strengthen our existing strategic relationship with Japan . Smt. Sitharaman in her keynote address acknowledged the experience and contribution of Japanese companies in India . The Minister talked about investment opportunities available in India with the goal to increase contribution of manufacturing sector to 25% of GDP by 2025. She also spoke of the various reforms and initiatives like National Investment and Infrastructure Fund (NIIF) for enhancing infrastructure financing, Digital India program to connect 250,000 villages with optical fiber and Jan Dhan Mission. ü Over 60,000 persons, including 1300 high risk persons, identified for investigation into claims of excessive cash sales under Central Board of Direct Tax (CBDT)’s Operation Clean Money (OCM) – Under the Operation Clean Money (OCM), more than 60,000 persons, including 1,300 high risk persons, have been identified for investigation into claims of excessive cash sales during the demonetisation period. More than 6,000 transactions of high value property purchase and 6,600 cases of outward remittances shall be subjected to detailed investigations under OCM. All the cases where no response is received shall also be subjected to detailed enquiries. Extensive enforcement action has been taken by the Government including search and seizure and surveys largely based on the information received during the demonetization period. More than 2,362 search, seizure and survey actions have been conducted by the Income Tax Department (ITD) during 9th November 2016 to 28th February 2017, leading to seizure of valuables worth more than Rs. 818 crore, which includes cash of Rs. 622 crore, and detection of un-disclosed income of more than Rs. 9,334 crore. More than 400 cases have been referred by ITD to the Enforcement Directorate (ED) and the Central Bureau of Investigation (CBI). Surveys have been conducted in more than 3400 cases by Assessment Units. Leave a commentEdit"NITI Aayog, identifies a set of 9 marketing reforms for Agriuculture"
Turkish President Recep Tayyip Erdogan to pay a two-day visit to India beginning April 30 during which the two countries will explore ways to strengthen anti-terror cooperation and deepen trade and investment ties. Erdogan’s overnight visit comes barely days after a referendum in Turkey on April 16 on whether to change the country from a parliamentary democracy to a executive structure led by the president. Turkish president will hold talks with Prime Minister Narendra Modi on May 1 on key bilateral, regional and international issues of mutual interest. With Turkey being a member of the Nuclear Suppliers Group, the issue of India’s membership bid of the elite group is likely to figure during the talks between the two leaders. Turkey is not opposed to India’s NSG membership but has been maintaining that the powerful bloc should come out with a system to consider entry of the countries which are not signatory to the Nuclear Non-Proliferation Treaty, diplomatic sources said. Leave a commentEdit"Erdogan to visit India from Apr 30"
Kremlin said on Friday it favoured diplomatic methods of resolutions of all crises, including on the Korean peninsula, amid mounting tensions between Washington and Pyongyang over North Korea’s nuclear program. “We call all countries for restraint, we call all the countries to refrain from any actions that could amount to provocative steps”, Kremlin spokesman Dmitry Peskov told a conference call with reporters. Earlier, US President Donald Trump vowed Thursday that the “problem” of North Korea “will be taken care of,” as speculation mounted that Pyongyang might be preparing another nuclear or missile test. “North Korea is a problem, the problem will be taken care of,” Trump told reporters. Leave a commentEdit"Kremlin calls for all sides to show restraint over North Korea"
Indian men’s hockey team will not take part in the Sultan of Johor Cup in Malaysia for the second year in a row, citing the presence of Pakistan in the event to be held in October. Sultan of Johor Cup is an Under-21 tournament and India won the title in 2015. It is not a global event held under the aegis of world governing body FIH or any continental body. In January, HI announced its decision not to play any tournament against Pakistan until they submit an unconditional written apology for lewd and unprofessional behaviour of the Pakistan team during the FIH Champions Trophy in India in 2014. The matter did not end there. Ahead of the 2016 Junior World Cup in Lucknow, Pakistan Hockey Federation alleged that India did not want Pakistan to take part in the tournament. India had outrightly rejected the claim. Eventually, Pakistan did not take part in the Junior World Cup. “Though Hockey India and its players had let go of the hurtful incident in 2014, it was the recent allegations by PHF (during the Junior World Cup) that has resulted in India pulling out of this tournament.